Home > Case Studies > I Have a Fear of Height, and I Am a Pilot! My first memory of flying was when I travelled with my parents on holiday to the US. I was only eight years of age, but I knew then that flying was something special. I didn’t know however, that flying would become my passion, and my vocation. But at that tender young age, I knew little of the challenges that faced me in later life, challenges that could have so easily stopped me achieving my dream. It was during my holiday to the US that I found out how much I hated being on top of buildings. My parents took me to the Empire State Building in Manhattan, and I simply froze when we got out onto the viewing area. Coaxing me back inside, my parents realised that I had a serious psychological fear. Although our family GP didn’t really offer much in the way of a solution, he did suggest several alternative therapies that may prove useful, such as hypnotherapy, stress counselling and even meditation. Over the next fifteen years, I tried various remedies and therapies, but nothing seemed to work. Eventually, I just accepted that I couldn’t stand on top of tall buildings, or bridges, and look over the side. However, by accepting this, I also accepted that I would never be able to sit on the flight deck at the controls of commercial aircraft. So I kept looking for solutions. Hypnotherapy, relaxation, meditation, acupuncture and yoga – I tried them all! During University, I joined the gliding club. At first, I thought I would simply help out at the club, never expecting to go up in a glider. After all, who would take up someone with a severe fear of heights? Watching the gliders gracefully moving though the air like gigantic birds, I longed to be up there. Realising my ambitions, one of the instructors suggested that I ‘give it a go’. I couldn’t believe that someone was willing to take me up. He simply said: “Well, if you freeze at the controls, I will take over and land it for you”. That first flight was remarkable, breathtaking and unforgettable. I had a grin on my face for the entire 45 minutes as we soared high above the fields in a machine that was elegant and smooth. Even the landing was a truly exceptional experience for me. I stared ahead at the airfield during the descent and watched the tiny houses and fields grow bigger and bigger in the windshield. Finally, we touched down onto the grass strip. No fear was going to stop me doing this again. 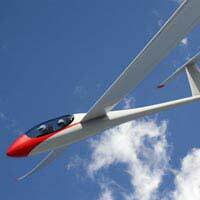 Following that first flight I trained to become a glider pilot. Then I went on to pass a flight test on a powered aircraft. And finally I booked an appointment with an Approved Medical Examiner, to see if it was possible to pass a full commercial pilot's medical. The news was unbelievable – he saw no reason why I couldn’t pass the full medical. None of his tests indicated that I had a fear of heights and none of his tests suggested any reason why I couldn’t fly for a living. As I was about to leave the consulting room, I asked him why my fear – the same fear that caused my parents such distress on that day long ago on top of the Empire State Building – seemed to have gone. He told me that sometimes we develop fears as children and, since those fears are embedded into our long term memories, when we reach adulthood, we simply just accept that the fears are still there. However, if we have a strong desire to overcome those early memories, there can be no reason why the fears don’t simply disappear. I owe that first glider flight to my instructor. He was brave enough to give it a try. Afterwards he told me that he could see the passion in my eyes as I watched the other pilots flying their gliders. He said: “If you think you have a passion for something, but achieving that passion is stopped by a stupid psychological fear, then the passion isn’t there. But if you truly have a passion to achieve something, no fear will be great enough to stop you”. I now use those words when I am working with people who truly want to fly but who feel that they have an over-riding fear that stops them.